With huge variety of eCommerce development platforms available in the current market, a typical eCommerce solution can’t provide you the flexibility that you need to maximize profit and increase conversions for your business. We, at Interface Software Services, offer budget friendly Ecommerce solutions that can be availed in a wide range of options. Our custom eCommerce developers will make sure that your eCommerce website is built with a rigorous business strategy and advanced technologies. We specialize in the process of providing functionality requirements of e-commerce such as content management, marketing databases, e-procurement, e-catalogues, and information portals and various other high-end well developed features and products. 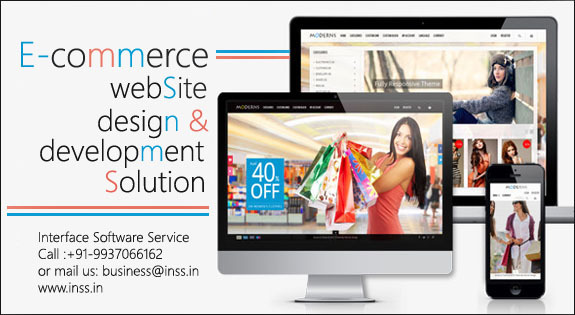 Our ecommerce website development company provides business specific solutions understanding your requirements and create web store with features that compliment your niche. Our ecommerce solution has all basic features required to run a successful online selling business. eCommerce website not only needs a very good development strategy but also strategy for good position in Search Engine results. Our specialization comes handy to meet and exceed these expectations. Our developers keep all these aspects in mind when doing eCommerce website development and later we complement it by our SEO solutions to provide rock solid web presence that is result oriented. Whether you want to sell 5 products or 50000, we provide a solution that fits your needs and budget. We understand it very well that a single eCommerce solutions doesn’t fit everyone’s needs. It is required for an eCommerce service provider to understand customer’s needs and provide flexible solution accordingly. Ecommerce Software Bhubaneswar, E-commerce Management Software Company Odisha , Ecommerce Website India,Ecommerce Software Development,Ecommerce software bhubaneswar,Ecommerce Website Development Company,E-commerce Shopping Software,Ecommerce Software Solution,Ecommerce sale Software odisha,Online Shopping Website India,Hotel Shopping Payment Gateway Integration,Ecommerce Web Development,E-commerce Business Softwate ,Online Ecommerce Software Service.